In Case You Missed It Film Review “United 93”In Case You Missed It Film Review “United 93”I wrote this review for my local church paper for the release of “United 93” in 2006. The highest achievement in cinema is when a film transcends the medium and is experienced rather than simply seen. United 93 joins the very short list of films, most recently Schindler’s List and Saving Private Ryan where viewers emotionally experience the event rather than simply watch the retelling. These films allowed viewers to simulate in the slightest of ways what it was like to be a victim of the holocaust or a soldier hitting the D-Day beaches. Through masterful direction, realistic and straightforward dialogue, and a passion for telling, not dramatizing, a story that must be told, viewers truly become involved in the story. Writer / director Paul Greengrass uses these elements to present a film that transcends into the realm of experience, and the result is most powerful. While United 93 is a “not to be missed film,” it is also a film that not all should see. Many may never be in the place that they can experience again the tragedies of that 9/11, but for those who decide they can relive that day and re-experience those emotions, United 93 is a must see because this story, the events and their impact, must not be forgotten. While the memory remains, for most people the magnitude, the shock, and pain has diminished since 2001. While it is good that the nation has processed these feelings and, outside of those with a personal connection to the events, no longer struggles with them on a daily basis, we should not allow those feelings to be beyond our memory. By experiencing United 93, or going through the decision process of whether to see the film or not, we are reminded and able to recall the memories and feelings of September 11, 2001. Remembering is not the only reason one might decide to experience the film. I believed I needed to be a part of the United 93 experience because it was something I should do in tribute to the victims and demonstrate support for their survivors. After 11 years in ministry, I have found that one of the most challenging yet important ministries is the ministry of presence. During difficult times when nothing can be done to remove pain or change reality, the willingness to be present with someone in their suffering can offer comfort, strength, and peace. While I cannot bring a loved one back, by re-experiencing this day as I sit through and support the film, I am telling survivors that they are not alone, nor are their loved ones forgotten. In the Christian faith, all people are ministers whether they are lay persons or ordained clergy, and all are called and able to offer this ministry. A strong showing of support for this film will hopefully offer the loved ones of those who died such solace and peace. Those who decide to see the film should be prepared for a difficult and powerfully profound experience. As I watched the film and experienced again the events of 9/11, I became aware of my physical reaction. My stomach was tense, and my breathing was faster. As I became attuned to my reaction to the film I also became aware of the reaction of others. I noticed there were no ambient sounds in the theater, no coughs, sneezes, whispering, or shifting in seats. Everyone in the theater was involved, was, in spirit, on the plane and in the various FAA and military control centers. We were there as silent observers from the post 9/11 world witnessing the world change before the character’s eyes. The fact that many of the controllers and other personnel were portraying themselves gave the film a powerful sense of reality that one could feel. 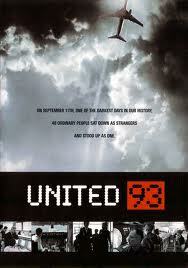 As I relived that day I was struck by the power and appropriateness of the film’s title, “United.” While named for the flight’s official designation, I became aware that all the persons on the plane were united in their situation and determination to both survive and avert another national disaster. Everyone in the theater was united in reliving our memories. As a nation we were and are united by the events of that day. While families and friends of those killed were most impacted, the events of September 11th changed the lives of all Americans and other nations victimized by prior and subsequent acts of terror. September 11th was a day that changed the world for everyone. Amidst daily reminders of the fractured and divided state of our nation and society, it is good that we can be reminded at a deeper level how united we can be. This entry was posted in Faith Shots, Film Shots, Scattershooting and tagged 9/11, 9/11 remembrance, Christian faith, clergy, events of september 11, faith, faith and film, lay ministry, ministry of presence, Paul Greengrass, presence. Bookmark the permalink. On this the 15th Anniversary of 9/11 I am reposting my review of the powerful film of that day.